Welcome to Escape Room The Game by Identity Games. Feel the thrill and enjoy the mystery from an escape game in your own home! As is the case in many Escape Rooms across the world, you are "locked in" in this game and the object is to find the codes to "escape" within 60 minutes by solving puzzles in riddles. Use your brain! Teamwork, good communication, ingenuity, creativity, logic and attention for detail are all very important in this exciting game. 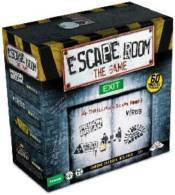 The box contains four different Escape Room adventures and each adventure has three parts. In each part, you must find a code consisting of four keys that you enter into the Chrono Decoder by using four of the 16 keys.